The Salt River Rafters sent Adam Ravenelle and Christin Stewart as Detroit Tigers Arizona Fall League representatives to participate in the Fall Stars competition on Saturday. For Ravenelle, it was a return to the mid-season outing, having received a selection last season, along with JaCoby Jones in his first Fall League appearance. For Stewart, it was a first nod as a Fall Star and he made sure that people would remember why he was selected. Neither member of the Tigers system received a starting nod for the evening, but Christin Stewart got an opportunity to contribute, entering in relief to left field for Blue Jays prospect Anthony Alford. Stewart had his first chance in the seventh, flying out against Cincinnati prospect Barrett Astin. There was a bit of vindication in the ninth, as Stewart cleared the wall with an offering from relief pitcher Trey Ball for a solo shot to mark his second home run overall in the Fall League. On the hill, Adam Ravenelle worked quick as a wink, entering in the eighth inning for the Fall League East. Ravenelle faced just two batters for 1/3 of an inning, hitting the first he faced and striking out the second for a total of a six-pitch night. The offense from the Fall Stars West strong-armed their way to a 12-4 victory over the East to end the night. At 14 games now submitted in the Arizona Fall League, JaCoby Jones has surpassed his involvement in his 2015 campaign and he's continuing to impress along the way. Jones added another three starts in the fourth week of Arizona play, tacking on more hits as he maneuvered his way through. With another three hits and pair of RBI in Week Four, Jones moves to 16 hits overall for Salt River with 9 RBI and an .806 OPS. With an outfield slot now open at Comerica Park, no doubt that Jones is using his time out west to show he doesn't plan on falling off the radar anytime soon. Two starts for the Tigers Triple-A backstop featured two very different outings through Week Four. A pair of hits and his fourth double on the year marked Greiner's first start in Week Four, but the following outing for the 6'6 catcher proved that baseball refuses to pick favorites. In Friday's contest, Greiner finished 0-for-5 for Salt River with one strikeout on the night. Start number four for the Tigers big right hander once again stayed true to his assigned three-inning outing, but a trio of runs allowed would be the force behind handing Turnbull his third loss of the Arizona League. Over his three innings of work, Turnbull surrendered the three runs (all earned), while walking four and fanning four against Peoria. Following the November 1 start of Spencer Turnbull, Jeff Thompson received a relief nod behind his Tigers teammate and unfortunately, the night did not go as planned. Over 1 1/3 innings for the Rafters, Thompson surrendered three runs (two earned) without a hit, walking five and striking out just one against Peoria. Following in the steps of a sticky November 1 outing, Artie Lewicki hit a similar bump in the road against Peoria, lasting just 1 2/3 innings for Sale River. In his relief appearance for the night, Lewicki allowed three runs off four hits, walking two and striking out two in the Salt River loss. · Tigers High-A infielder Zac Shepherd received selection to Team Australia for the U23 World Cup. Facing Japan in the final round, Shepherd went 1-for-3 on the night, launching a solo home run (his second of the playoffs overall) and a pair of strikeouts. Team Australia fell short against Japan with a final score of 10-3, earning an overall silver medal. Shepherd has been confirmed to join his hometown Sydney Blue Sox, once the Australian Baseball League kicks off in two weeks. Perth native Warwick Saupold also expected to participate with his hometown team, the Perth Heat. · Double-A Erie infielder Harold Castro showed off for the home crowd by posting a career-high five-hit night, adding a pair of RBI and pair of runs scores for the Caracas Leones. The night marks the first outing for Castro with more than three hits since July 23, 2011 where he went 4-for-6 in Rookie League play. 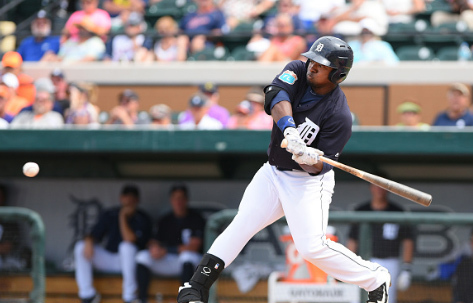 · Tigers outfielder Jason Krizan is making a name for himself in his first year of Dominican Winter League play. Splitting his 2016 regular season between Double and Triple-A ball within the Tigers system, Krizan is holding the number two slot among the DWL imports, hitting .321 for the Estrellas. Krizan knows a thing or two about hitting, securing the Eastern League Home Run Derby title earlier in the year as a member of the Double-A SeaWolves.